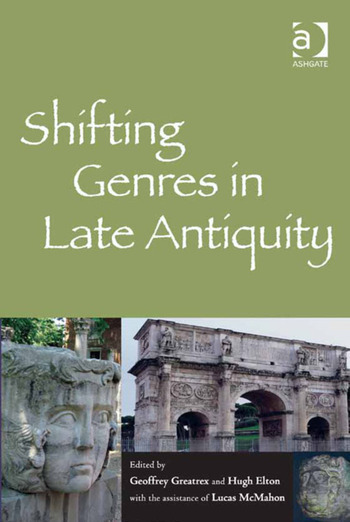 Shifting Genres in Late Antiquity examines the transformations that took place in a wide range of genres, both literary and non-literary, in this dynamic period. The Christianisation of the Roman empire and the successor kingdoms had a profound impact on the evolution of Greek and Roman literature, and many aspects of this are discussed in this volume - the composition of church history, the collection of papal letters, heresiology, homiletics and apologetic. Contributors discuss authors such as John Chrysostom, Ambrose of Milan, Cassiodorus, Jerome, Liberatus of Carthage, Victor of Vita, and Epiphanius of Salamis as well as the Collectio Avellana. Secular literature too, however, underwent important changes, notably in Constantinople in the sixth century. Several chapters accordingly reassess the work of Procopius of Caesarea and literature of this period; attention is also given to the evolution of the chronicle genre. Technical writing, such as military manuals and legal texts, are the focus of other chapters; further genres considered include monody, epigraphy and epistolography. Changes in visual representation are also considered in chapters devoted to diptychs, monuments and coins. A common theme that emerges from the chapters is the flexibility and adaptability of genres in the period: late antique authors, whether orators or historians, were not slavish followers of their classical predecessors. They were capable of engaging with their models, adapting them to their own purposes, and producing work that deserves to be considered on its own merits. It is necessary to examine their texts and genres closely to grasp what they set out to do; on occasion, attention must also be paid to the transmission of these texts. The volume as a whole represents a significant contribution to the reassessment of late antique culture in general. Geoffrey Greatrex is Professor in the Department of Classics and Religious Studies at the University of Ottawa, Canada, where he has taught for twelve years. He organised the conference from which this book stems and is a specialist in the history of the eastern Roman empire in the fifth and sixth centuries. He is the co-author of The Chronicle of Pseudo-Zachariah Rhetor: Church and War in Late Antiquity (Liverpool, 2011) and a sub-editor for the Encyclopedia of the Roman Army (Oxford, 2014). Hugh Elton is Professor in the Department of Ancient History and Classics at Trent University, Canada, where he has taught for seven years. He was on the programme committee for the conference. He is a specialist in late Roman military history and the archaeology of late Roman Anatolia. He is the author of Warfare in Roman Europe, AD 350-425 (Oxford, 1996) and The Frontiers of the Roman Empire (London, 1996) as well as co-editor of Fifth Century Gaul: A Question of Identity? (Cambridge, 1992) and Regionalism in Hellenistic and Roman Asia Minor (Bordeaux, 2007).